'I, myself, concentrated so much on my sixth sense that I developed this vision which sees beyond facts, the better to find sensations and divinations. It is possible I never learned the names of birds in order to discover the bird of peace, the bird of paradise, the bird of the soul, the bird of desire. It is possible I avoided learning the names of composes and their music the better to close my eyes and listen to the mystery of all music as an ocean. It may be I have not learned dates in history in order to reach the essence of timelessness. It may be I never learned geography the better to map my own routes and discover my own lands. The unknown was my compass. The unknown was my encyclopedia. The unnamed was my science and progress.' - Anaïs Nin, an excerpt from The Diary of Anaïs Nin, Volume 4: 1944-1947. After a little time away, I’m back. And with cake in hand. Not just any cake, rather, a Citrus Rose Battenberg Cake, in collaboration with and inspired byFoxtel’s Lifestyle’s show, The Great Australian Bake Off. 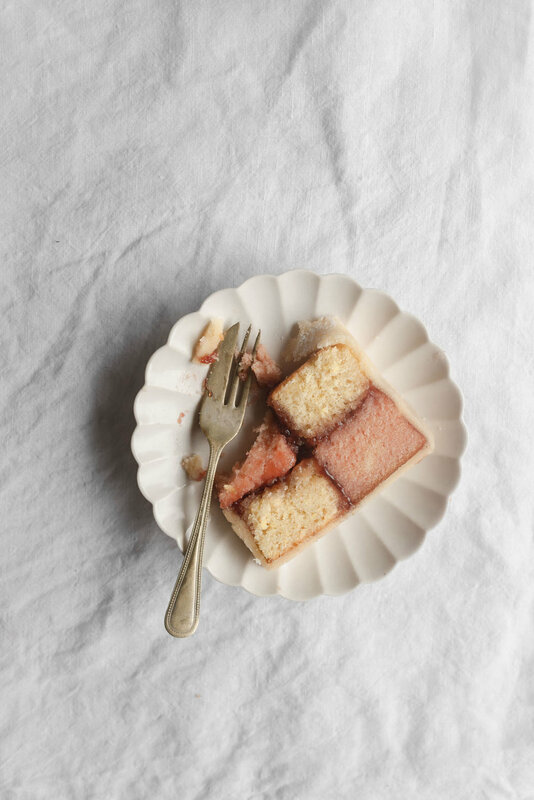 With its thick layer of floral infused marzipan, alternating layers of pastel rose-hued almond sponge, double citrus sponge, and raspberry preserves, it’s heaven. If you’ve been around this space for a while, you’d know that I began baking as an amateur. And through the evolution of the blog, some of it good, some of it not so good, but all of it growth, I emerged as a baker. Not a cook, definitely not a chef, but a baker. It took time, patience, tests, and trails. And there were many failures, stumbles, and missteps along the way. All of which I had to own. But we got there. And through owning it, came growth. To the point where the act of baking is as natural as breathing. Never a thought, not even conscious action, rather something that’s engrained within the very fibres of being. For me, as a baker, the act of baking is far more than just the end result itself. And I think that’s something we all share in common. Baking as connection. Baking as emotion. A slice of cake that conveys a deeply personal form of expression, of journey, and of life. It’s something that I see often, both within myself, and others. You don’t just have to be a baker to have it. It’s in all of us. I think that’s why we love The Great Australian Bake Offso much. It’s a reflection of experience, growth, and journey. Of story. Coming together in a common love. And sharing in that. Starting off as an amateur meant there was a great deal of learning that had to be done. And for me, part of that was reading, watching, and following the actions of others. Learning techniques through success and failure, like the softness of sponge, the breath of yeasted dough, and the perfect moment to take a chocolate chip cookie out the oven. Things that couldn’t be taught, but that had to be done. The Great Australian Bake Off was one of those things that helped me. I’d watch, learn, become inspired, and challenge myself in the same way the contestants were challenged. And then share in it all at the end. I think that’s what baking is all about in the end. Connection. And sharing a slice of sweetness along the way. Through this Citrus Rose Battenberg Cake, as inspired by the final episode of The Great Australian Bake Off, I encourage you all to share in it with me. Prior to this, I hadn’t made a Battenberg before. Not for any good reason, I’d always wanted to. And after watching, learning, discovering, and becoming inspired, I had to create one too. It’s a cake that’s far from the usual. Made with alternating layers of bright, floral, and delicate sponge, in addition to a slathering of preserves and sweet marzipan, it’s perfect. A cake that’s full of vibrancy and life. And one that’s perfect for the season. I think we all need a little of that. As Maggie Beer said, the sponge cake has to be soft and light. I find that sifting the flour three or four times beforehand helps the aeration within the cake which results in a perfectly light texture. Also, make sure that your eggs are at room temperature. For me, this means leaving them out on the counter a few hours prior to baking. And finally, make sure all your ingredients are measured and laid out beforehand, which allows for a smoother process and less chance of mistake. In this cake, I used the end of season’s tart raspberry preserves that I had from last Summer. You could use any jam or preserve that you desire. Anything berry, in particular, strawberry, is a favourite. I could also imagine that a really thick and sweet citrus curd would be beautiful too. The marzipan in this recipe is made from scratch. I wouldn’t recommend using store-bought marzipan. I personally think that home-made marzipan is so much more flavorsome, delicate, and delicious, not to mention easier to work with. Plus, it’s simple too. I hadn’t made marzipan all that many times before, but, after watching the show, it seemed a much more streamline and quick process than I had thought. If marzipan isn’t for you, you could also cover the cake in a thick layer of buttercream. You could decorate the cake however you desire. I loved how the contestants decorated their Battenberg cakes on the show. I’ve done it up once before with fresh raspberries over the top, but I’ve also left it plain, simple, and unadulterated. The choice is yours. For more tips, I would recommend watching the new season of The Great Australian Bake Off in particular, the final episode, which features the Battenberg challenge. First, make the marzipan. Place the almond, granulated sugar and confectioners’ sugar into the bowl of a stand mixer fitted with the beater attachment. Add the egg, rosewater and a few drops of food coloring (if using) and beat on medium-low speed until a soft, smooth and kneadable dough ball has formed around the base of the blade. Remove from the stand mixer and cover the dough in a layer of plastic wrap. Chill until needed. Next, make the sponge cakes. Pre-heat the oven to 180 Celsius. Grease and line two 22 x 13 cm loaf pans with non-stick parchment paper. In the bowl of a stand mixer fitted with the whisk attachment, whisk together the eggs and sugar on medium speed until pale, fluffy and doubled in volume, about 6 minutes. The mixture is ready when it is at 'ribbon stage', meaning that when the whisk is lifted it should flow like lava and hold a trail before collapsing back onto itself. Meanwhile, in a separate medium-size bowl, whisk together the all-purpose flour, almond meal and salt. Whisk the milk and vanilla bean extract into the egg mixture until well combined. Stop mixing and remove the bowl from the stand mixer. Use a fine mesh sieve to sift over the dry ingredients then gently fold using a large rubber spatula until almost combined. Some dry floury pockets should remain. Pour in the melted butter and again gently fold until just incorporated. Divide the batter between two small bowls. In one, fold in the lemon zest and in the other, the rosewater and pink food coloring. Pour each mixture into a prepared loaf pan. Bake for 20 to 25 minutes, or until the sponge springs back when gently pressed and a skewer inserted into the middle of the cake comes out clean. Remove from the oven and allow the cakes to cool in their pans for 10 minutes, then, transfer them out and onto a wire rack to cool completely before using a large serrated knife to level off any domed tops and brushing with syrup. In a small saucepan, combine the sugar, amaretto and water. Heat, stirring often to dissolve the sugar, until the syrup comes to a light simmer. Remove from the heat and use a pastry brush to glaze and moisten the tops of the cakes with it. To assemble the cake, slice the cooled sponge cakes lengthwise in half. You will have four evenly sized rectangular pieces to form the cake. Set aside. Set the marzipan out from the refrigerator and onto a work surface dusted with confectioners’ sugar. Using a rolling pin lightly dusted with more confectioners’ sugar, begin to roll the marzipan roughly out and into a large rectangular shape that’s about 42 x 22 cm in diameter. Spread a thin layer of the raspberry jam over the marzipan. Place a lemon sponge in the middle of the marzipan, then, place a rose sponge directly next to it. Spread a little more raspberry jam between the two cakes to sandwich. Repeat this process with the remaining cakes over the top to form one large layered cake in a chequered pattern. Carefully lift the edges of the marzipan over the top and sides of the cake. Tightly enclose it to seal then invert the cake so the marzipan seam is facing down. Dust off any remaining icing sugar. Place the cake in the refrigerator to chill until firm, about an hour. Just before you’re ready to serve, use a sharp knife to neatly trim off the ends to reveal the chequered pattern within. Thanks to Lifestyle for sponsoring this post. As always, all opinions are my own. Stream The Great Australian Bake Off available on Foxtel’s Lifestyle Now. You can keep up with the show on their Facebook and Instagram.